I am reluctantly posting my first weeks challenge...decorating a cake for my dear friend Ruth. 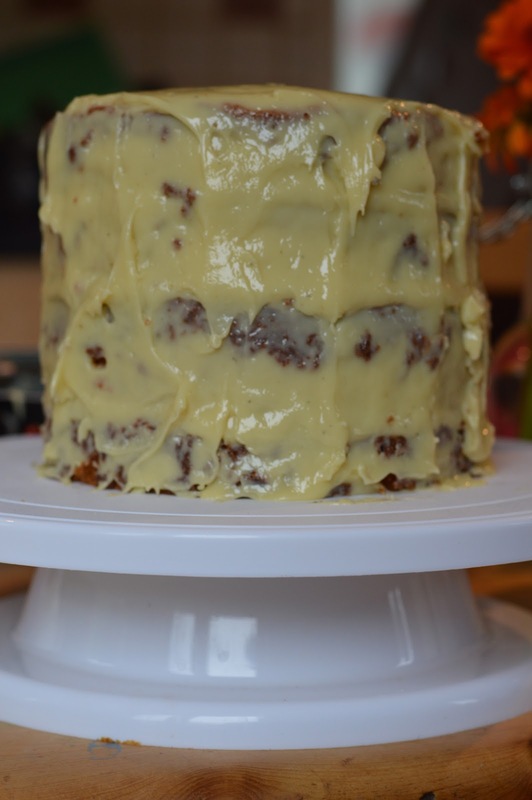 I am only reluctant because I do not want you to think this is a blog just about cakes, instead it is about a different creative challenge each week. However I had no say in when Ruth was born, and so here is my offering for this week. All that said I had lots of fun learning to make this cake and I am quite pleased with the final piece. Ruth is rather keen on white chocolate and so I surfed the net and found an achievable recipe from Nigella Lawson called White Chocolate Mud Cake and set to make four round sponges. Whilst nigella's recipe is divine, this could just have easily been made with regular sponge cakes and butter icing. The four cakes are piled high layered with raspberry jam and then covered over with Nigella's sticky white chocolate ganache. I am sure this cake would not be as dramatic if the cake was not so tall, so four layers works well. You can see my white plate on this photo. It is actually an icing turn-table which I purchased at The Works for a few pounds. It not only lends itself to easy icing, but also doubles up as a good presentation plate. 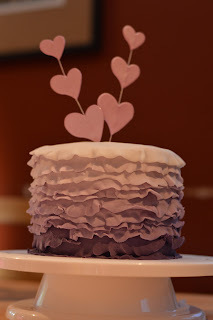 I used a pack of white roll out icing that I divided into six equal sizes and coloured varying shades of purple leaving one block totally white. 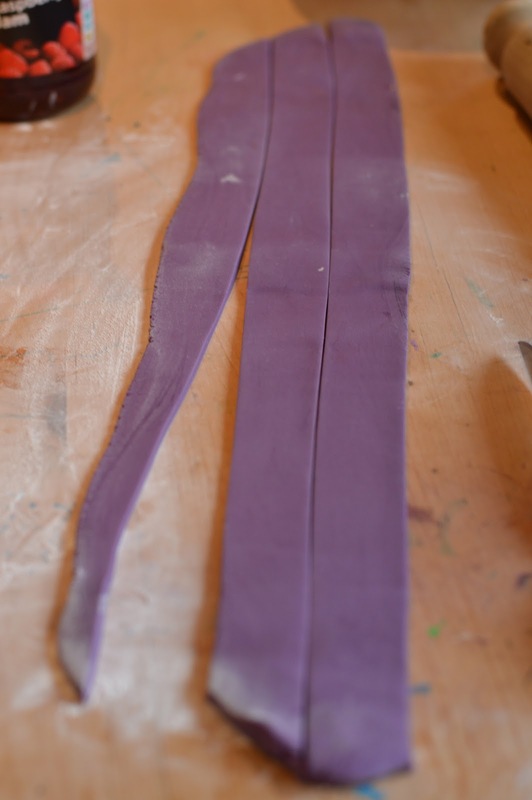 Then I rolled out each shade and cut into two long strips. Then using my thumb and finger pinched down one of the sides making the ruffled effect you can see in the second photo. Now that the icing is ruffled I slowly stuck them onto the sticky ganache which acts as glue. I started at the bottom with the darker coloured icing and worked round and round the cake. The cake is finally finished at the top with a round piece of icing that is slightly larger than the cake that I pinch around to give another ruffled layer and fed over the top of the cake to cover the top layer of icing. This was the first time I have tried this, and it took me 40 minutes to dye all the icing and decorate the entire cake, which isn't long at all. I like the fact that you don't have to be too precise in order to get quite a dramatic effect. Beautifully decorated cake, and am sure that Ruth loved it. When I first looked at the cake I thought that it was covered in Buttercream Frosting using a tip to give the ruffled edge, which I thought was a great idea as I really don't like the taste of fondant icing!! 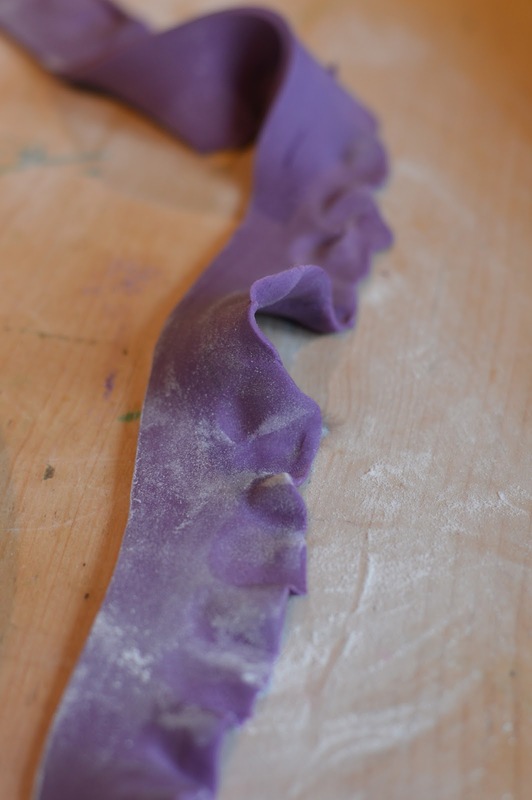 Keep up the great blog, loving seeing any new ideas whether baking recipes or decorating ideas! !